We’ve all heard of the Etsy’s, Ben and Jerry’s and Patagonia’s of the world that have become B Corporations. But there are also a lot of new entrepreneurs and small businesses coming out of the woodwork who seek to create social enterprises and companies that are built on a new foundation that’s better for our world. Take for instance Lucky Iron Fish, a Canadian B Corp that manufacturers little iron shaped fish that help combat iron deficiencies in Cambodia, North America and beyond. I had a chance to connect with Tania Framst, Vice President of Operations, who was eager to share some insight about the company’s successes and experiences. CSRtist: Tell me a little bit about your business model. Tania: Well, we’re a social enterprise and a small business that believes it can do good and make a profit. We are part of the one-for-one business model family, which means we gift many of our fish to families who otherwise could not afford to purchase our life-changing product. CSRtist: What made you decide to pursue B Corp certification? Tania: We first heard about B Corporations from MaRS Innovation. We truly believe that business has the capacity, resources and responsibility to do good. As a small, relatively new company, we felt we needed something significant to prove our commitment and credibility. Our product is very simple and sometimes people are hesitant that something so simple can be effective. The B Corp stamp is a tangible symbol that we meet high standards of accountability and transparency and our customers can feel confident that their purchase is making a difference. The opportunity to be part of an incredible community committed to social good was also a huge factor. CSRtist: Is there a benefit to choosing the iron fish over iron supplements? Tania: Yes. The fish can provide a family with up to 75% of their necessary daily intake if used on a consistent basis. Stats show that people comply with the use of iron supplements only about 35% of the time. Compliance with the iron fish sits around 90%. The positive effects of attaining proper iron levels are well known, but iron pills typically have side effects. The iron fish has no side effects. In addition to this, a lot of Cambodian families regard their iron fish as a good luck charm, which closely resembles the locally caught kantrop fish (also symbolizing luck for many locals). This is great, because it removes the taboo and fear from trying something new, curtailing trepidation and iron deficiency. CSRtist: Your website mentions that the iron fish are made from recycled materials. Can you elaborate? Tania: We use recycled iron. What’s great about iron is that it can be melted down and reused over and over again. Rest assured, we test our Lucky Iron Fish using WHO standards to make sure they are safe. We manufacture the fish both in Canada and Cambodia. CSRtist: What’s the story behind the beautiful packaging? 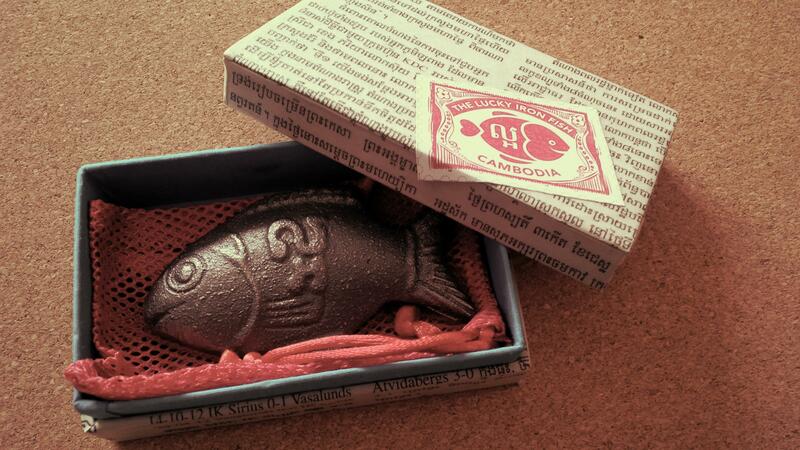 Tania: Lucky Iron Fish that are sold (or gifted, dependant on a family’s need) in Cambodia are packaged in palm leaf boxes made by Watthan Artisans Cambodia – a cooperative of people with physical disabilities (many of which have been caused by land mines). Lucky Iron Fish that are made and sold in Cambodia are accompanied by pictorial and written instructions, in order to meet the needs of our customers in that market. Lucky Iron Fish that are sold in Canada are packaged by ARC Industries, a community organization that provides employment training and support for people who have an intellectual disability. CSRtist: How can people get involved in your mission? Tania: Every time you buy a fish, we give a fish to a family in need. In addition to purchasing and using a Lucky Iron Fish, you can also become an ambassador by sharing recipes with us and the Lucky Iron Fish community! 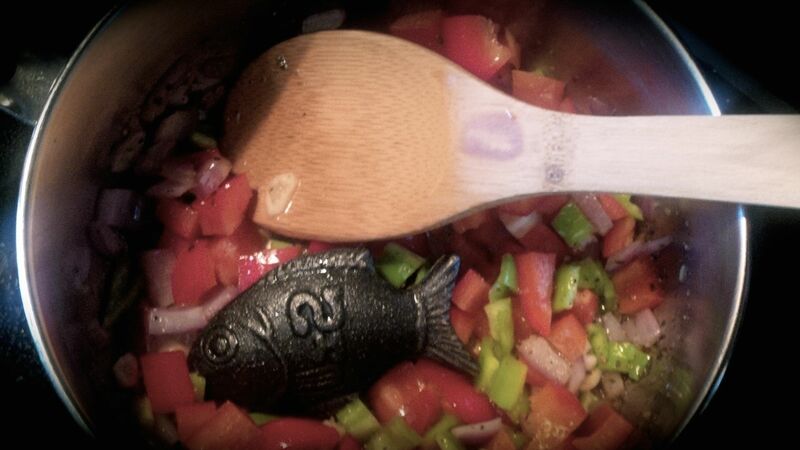 A veggie pasta meal being cooked with a Lucky Iron Fish. Taking Tania’s advice to heart and wanting to get a first hand glimpse of the little fishy, I decided to grab myself one and test it out for myself. As a pescetarian, I was definitely intrigued by the benefits this would provide to my own health and diet. I decided to add it to my tried and true veggie pasta and I have to say it turned out amazing! It was incredibly simple too. I just added the fish to my vegetables as they sautéed, leaving it in the pot for ten minutes while I added ingredients to complete my tomato sauce. Just don’t forget to boil your fish in water before you begin! Cooking instructions can be found on the Lucky Iron Fish website. My iron fish proved to be a great addition to my meal and to the world too! Companies like Lucky Iron Fish demonstrate that even small businesses can be a force for good. No matter your company’s size, you can start making a difference today. If you’ve enjoyed this B Corp review, be sure to follow the blog by subscribing to the website. I also welcome you to join the conversation with me (@CSRtist) on Twitter with the hashtag #TheBSeries. Okay. So this is truly an amazing concept. And I love your design and packaging. Well done!